IN STOCK - Great for flat tops or use with a clipper. The 299 is 9" long with 1.5" medium spaced teeth. 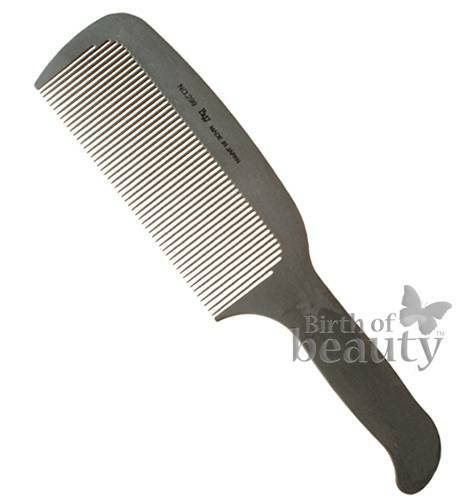 The medium spaced teeth are good for all hair types and the comb is ideal for flat tops and working with clippers. All BW's Carbon Combs are lightweight and completely anti-static, so they do not snag the hair. The teeth are incredibly smooth so they easily move through the hair. The Carbon combs are heat resistant, can be sterilised by boiling and also used with a dryer. IN STOCK- The 299 is 9" long with 1.5" medium spaced teeth. The medium spaced teeth are good for all hair types and the comb is ideal for flat tops and working with clippers. All BW's Carbon Combs are lightweight and completely anti-static, so they do not snag the hair. The teeth are incredibly smooth so they easily move through the hair. The Carbon combs are heat resistant, can be sterilised by boiling and also used with a dryer.